Recently, we identified a performance issue with a query once we upgraded the database server to SQL Server 2016. If you look at the query, it uses system catalogs to fetch some data. This query can be optimized or rewritten in better way, however, we are going to discuss about how the same query behaves with different scenario/settings. The above query runs for 3 minutes in SQL Server 2016 with compatibility 130, but quite faster in SQL Server 2008 R2 that returns in 3 seconds. It is also observed that, when we change the compatibility 100 in SQL Server 2016, the query runs faster as expected. Table 'sysidxstats'. Scan count 7971, logical reads 38154, physical reads 0, read-ahead reads 0, lob logical reads 0, lob physical reads 0, lob read-ahead reads 0. Table 'sysschobjs'. Scan count 13063, logical reads 104556, physical reads 0, read-ahead reads 0, lob logical reads 0, lob physical reads 0, lob read-ahead reads 0. Table 'syscolpars'. Scan count 3265, logical reads 8681635, physical reads 0, read-ahead reads 0, lob logical reads 0, lob physical reads 0, lob read-ahead reads 0. Table 'sysiscols'. Scan count 2696, logical reads 6120, physical reads 0, read-ahead reads 0, lob logical reads 0, lob physical reads 0, lob read-ahead reads 0. Table 'sysidxstats'. Scan count 235, logical reads 1280, physical reads 0, read-ahead reads 0, lob logical reads 0, lob physical reads 0, lob read-ahead reads 0. Table 'sysschobjs'. Scan count 11, logical reads 1314787, physical reads 0, read-ahead reads 6, lob logical reads 0, lob physical reads 0, lob read-ahead reads 0. Table 'syscolpars'. Scan count 1, logical reads 2659, physical reads 0, read-ahead reads 0, lob logical reads 0, lob physical reads 0, lob read-ahead reads 0. Table 'sysiscols'. Scan count 2, logical reads 410, physical reads 0, read-ahead reads 0, lob logical reads 0, lob physical reads 0, lob read-ahead reads 0. If we see the IO statistics, we can clearly see that the number of IO is more with compatibility 130 compared to 100. So it is evident that there are some fundamental changes at optimizer level that causes this difference. Once we set lower compatibility, we will not be able to use new features introduced in SQL 2016 like RLS/In Memory OLTP and many others. Trace Flag 9481 forces Legacy CE model used by SQL Server 7.0 – 2012. There are three ways to use this option for different scopes. a. Query Scope: Use QUERYTRACEON query hint specified in the OPTION clause for a query. 1. This option is to use trace flags at the query level. The change is ONLY applicable for the query, It does not have any impact on other queries. 2. This option requires sysadmin fixed server role. In production, it is unlikely to have this privillage in most cases for application logins. 3. This requires changes in the procedures/application code. b. Session Scope: If you dont want to make any modification in query or procedures or there are many places we need to make the changes, then you can use this option at session level to use the legacy cardinality estimator. 1. It may appear to be a quick fix in first place. But, this will not use the latest CE abilities. 2. If the procedure plan is already cached, then it will still be continuing to use the old one. c. Global Scope: Trace flags can be set at server level and the changes will impact on every connection to the SQL Server instance. Go To "SQL Server 2016 Configuration Manager" -> "SQL Server services" -> Right Click on the Service -> Properties -> Startup Parameters - > Add "-T9481". 1. When you want to move your databases to use compatibility of 130 (to use new feature), but, you still need some time to test the existing code performance with new CE. 2. You may be restricting the new CE cost based benefits while creating the plans. This is a new feature added to SQL Server 2016 – Database Scoped Configuration. To stick with the subject, lets cover LEGACY_CARDINALITY_ESTIMATION option in this feature. We have seen QUERYTRACEON option at different scopes like Query/session or Server level. 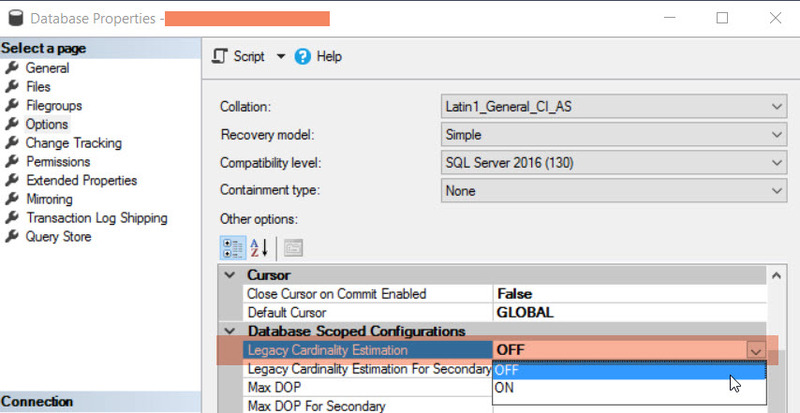 SQL Server 2016 provides another option at DATABASE level using LEGACY_CARDINALITY_ESTIMATION. There are two ways, we can use this option. b. Using Query HINT: SQL Server 2016 SP1 introduced a new query hint which will influence the query optimizer. This does not require the sysadmin fixed server role unlike QUERYTRACEON, however, it is logically equivalent of the same. Additional information: Using DMV sys.database_scoped_configurations, we would be able to see the settings with Database scoped configuration. Hope, this helps you to understand various options to use Legacy CE in SQL Server 2016.